This weekend Tom and I went to visit our friends who live just on the PA/Delaware border on the loveliest plot of land. They have a garden full of fresh veggies, trails running through the woods and lots of animals running around. I spend a bit of time playing with their newest additions, a five month of Rottweiler puppy and two rescued Great Pyrenees puppies. Needless to day I was in puppy heaven. There was also a coop of Rhode Island hens and I came home with a dozen fresh eggs. We grilled quesadillas and drank Dos Equis and watched the toads come out when the sun went down. It was pretty much perfection. It almost made we want to give up city life for a little bit of the country. glad to see those shorts out again, they look so nice on you! This is so simple and beautiful! I'm always on the lookout for sheer little tops like this. And those shorts are a perfect pair! A weekend in the country with lots of dogs and good friends sounds wonderful. That blouse is great. I don't often wear separates, but this post is making me want to experiment a bit with it. First off, amazing outfit! We gave up city life for the country. We have a mountain house where we watch the stars, raise chickens and grow veggies. Yet, we are still an hours drive from Los Angeles. A wonderful casual outfit! I really love that blouse with the high-waisted shorts. love the polo and the wedge! That's such a lovely floaty blouse! 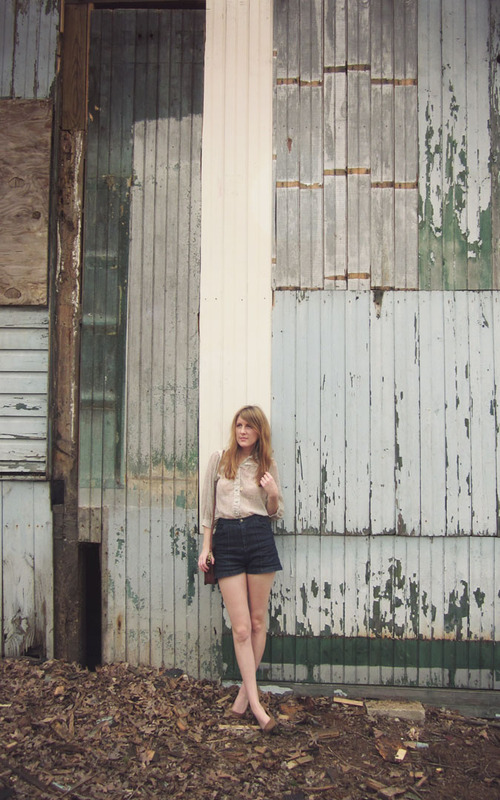 I adore the first photo of you, especially the layers of peeling paint on the structure (barn?) behind you. The vintage top is gorgeous too, it's an unusual combination with the shorts that works so well. Fresh eggs sound delicious, living in Chicago I miss having a garden and ready access to open expanses of land. sounds like a perfect weekend to me! while i love escaping to the country, i don't think i could give up city living for it all the time, but it sure is a nice way to unwind and enjoy the simple pleasures in life. i love when you post loads of photos. It's great. you look lovely and that blouse is so nice.